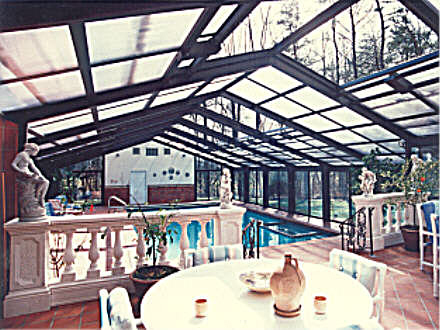 Roof panels, both opening and stationary, constructed of impact resistant and fire-retardant insulated polycarbonate in either clear of bronze tint. Non-corrosive structural aluminum components and stainless steel fasteners. Attracts customers year round in a hotel or motel setting. Increases participation in swimming and club activities for YMCA's , schools, or organizations. 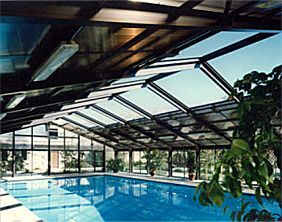 Improves your pool security - Atria structures can be locked to protect your pool from intruders. 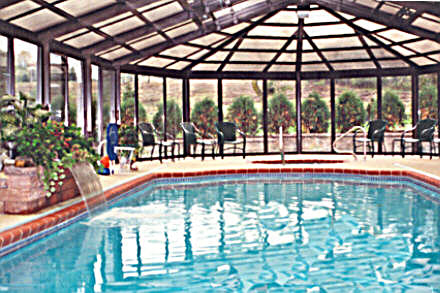 Creates a great space for exercise and swimming workouts in all seasons.